In 1949 and 1950 Fordham was enjoying its last brief fling of gridiron success before shutting down the Division I program in 1955, while in 1949 Georgetown was but one year away from closing theirs. This relatively small timeline difference showed up in this game at the Polo Grounds, as the Rams simply blasted the Hoyas right into the nearby Harlem River. 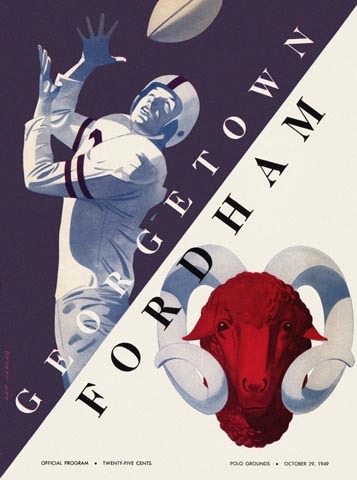 Another classic Lon Keller cover illustration only adds to any Fordham fan's enjoyment.